U.S. firearms policy… a very heated national debate, and a frequent topic of discussion worldwide. You might already have a sense of the role you play personally, among friends and family, or politically. To move towards a society less polarized by the ownership/control debate, we ask you this — what role in this effort might you play as an interculturalist? With similar and different values held by firearms and control enthusiasts, how can we bridge the gap? We’ve been exploring just that and invite you to join us at the upcoming SIETAR-USA (Society for Intercultural Education, Training and Research) conference in Arlington, VA, November 6-9, 2013. Cultural Detective will be used in several concurrent sessions during the conference, including in Dianne Hofner Saphiere’s and my session: Gun Violence, Gun Rights and Gun Control: Do Interculturalists Have a Role in Firearm Policy? That session will be held Friday afternoon, November 8, from 3:45-5:00. We hope to see you there! We believe interculturalists are uniquely positioned to build constructive dialogue around this important national concern and using the Cultural Detective Model, we would like to share our work with you. This entry was posted in Cultural EFFectives – Successes, New course/workshop, Press Release and tagged cross-cultural skills, Cultural Detective, diversity and inclusion, Firearm, Gun control, Gun politics, Gun violence, intercultural competence, Pro-Gun Rights, United States by Dianne Hofner Saphiere. Bookmark the permalink. Interesting (if somewhat one dimensional) statistics on firearms ownership. According to Wikipedia the intentional homicide rate in Mexico is 23.7 per 100,000. That compares to 4.7 in the U.S. (which is less than half what it was at its height in the 1990s). According to research by Kleck and Gertz Americans use a firearm in self defense or defense of property over 2.5 million times a year and upwards of 400,000 lives are saved. vol. 86, no. 1, 1995: 150. In the U.S until recently the crime of home invasion (breaking into a house you know is occupied) was fairly rare. Not so in the U.K. where firearms ownership is much lower. Of course the U.K. was voted the most violent nation in Europe by the UN not long ago. 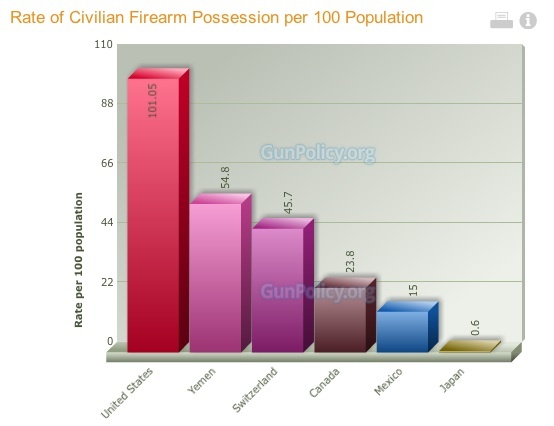 You show Japan on your chart and of course firearms ownership there is extremely low. Interestingly enough they have almost double the suicide rate of the U.S. (Wikipedia: U.S. 12.0 per 100K, Japan 21.7 per 100K). So it looks like people still kill themself whether or not they have a gun. You didn’t show the U.K. but despite all of their efforts to ban most civilian gun ownership they have a nearly identical suicide rate as the U.S. ( U.S. 12.0 U.K. 11.8). Thank you for your comment and link, free2be. The point is to build dialogue and discussion during which we truly listen to and hear one another, rather than further an agenda. Our belief is that such polarized positions do not build community or consensus but rather, that hearing one another will help resolve the heated debate. Hopefully when you are working on consensus you will listen to people who mention that facts that I did. Otherwise you are just talking in an echo chamber. Yes, we need to look at facts, and listen both ways.